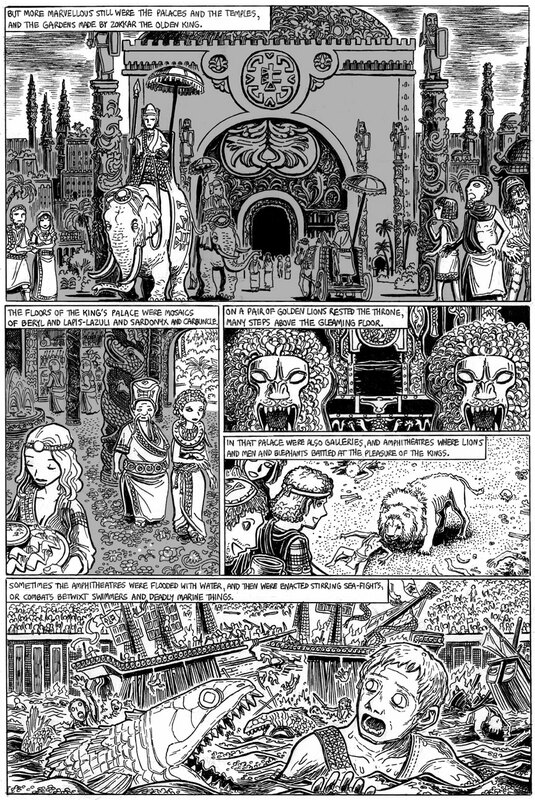 It’s a few days late, and I’ve got “1:30 AM not quite sure how it will look in the morning” goggles, but here’s the latest page of “The Doom That Came to Sarnath”! Thanks for your patience, I hope you’re enjoying the pages. It’s a sweltering hot summer here in Seattle; even our last usual rains have dried up. I’ve been listening to yog-sothoth.com and The Double Shadow while drawing, and looking forward to the new ‘classic horror’ phase of HP Podcraft. I’ll also be exhibiting at GeekGirlCon in August in Seattle; more news closer to the big day! Jason, I was recently turned on your site. I think your treatment of “Doom” is frankly, genius! i had always envisioned Sarnath to be a Romanesque sort of city but your Babylonian/eastern vision works so much better. Thanks NuclearSaturday! Yes, to me Sarnath seems inspired by Oriental tropes, so I’ve been going for a kind of Central Asian/Mesopotamian/and slightly Chinese style. Loving it, Jason. Thank you. You reminded me of how much I enjoyed the early HP Lovecraft, Lord Dunsany, Clark Ashton Smith, and others I first discovered in the classic Ballantine Books Adult Fantasy series of the 1960’s and 70’s, edited by Lin Carter. I’m giving a number of them a nostalgic re-read. Many of these stories, like The Doom That Came To Sarnath and The Dream-Quest of Unknown Kadath are eternal. The citizens of Sarnath seem a degenerate bunch, grinning at the lion tearing up that poor guy. And those deadly marine things are quite something. I don’t give much for the swimmers’ chances, what with having to swim, wield a weapon and cope with a sea-monster simultaneously! Rome had such games in some cases animals both on dry land and filling it with water, small sea battles betwixt professional fighters and condemned men. Better than having resources wasted on long incarceration. Here they get their law and their entertainment.